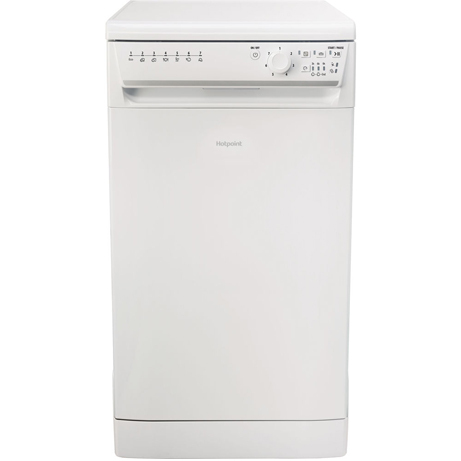 This Hotpoint Aquarius Dishwasher comes in a classic white finish. 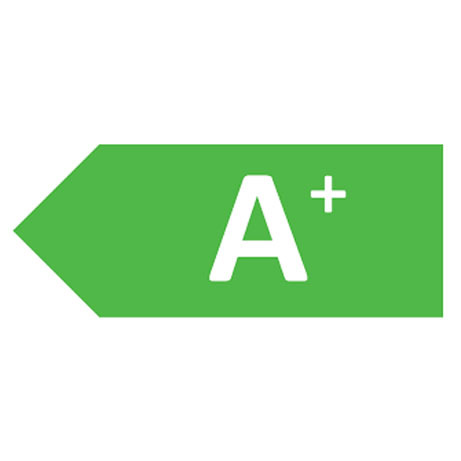 Its A+ energy rating is great for conserving them energy bills. The multi tab function will maximise use of your tablets to give great wash results while the quick wash is ideal for smaller loads when you’re in a hurry. 10 place settings is ample room for any family and its smaller compact design is great if space is an issue. 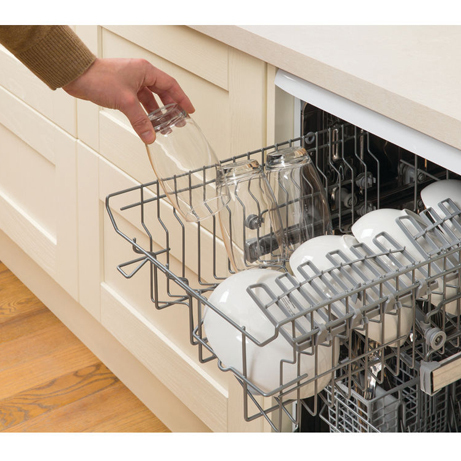 Make your life easier and let this Hotpoint Dishwasher do your dishes. This Hotpoint Slimline Dishwasher is simple and stylish by design. This machine will slot into your kitchen seamlessly whilst providing you a fast and efficient cleaning solution for all your kitchenware. Thanks to the slim-line design, this Hotpoint appliance is perfect for smaller spaces. If you have limited kitchen space, this dishwasher will make a great choice – conveniently designed for smaller homes or flats. Designed to offer versatile cleaning options, the Flexiload system allows you to adjust the set-up inside the cavity. Using colour coding, you can easily create additional space for larger pots and dishes. The patented 3-stage water filtration and durable stainless steel interior, provide effective, hygienic cleaning power that keeps bacteria at bay. Save plenty of time when you need certain items back in a hurry. Choose the 25 minute wash programme for ultimate convenience. Set the time of the cycle to start at a time that suits your day. Have the dishes ready to put straight into the cupboards when you arrive home from work. With an A+ energy rating, this Hotpoint dishwasher helps save you money on your water and energy bills. 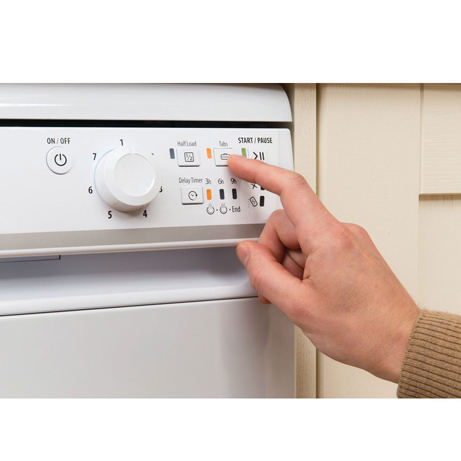 The half load function is perfect if you haven’t completely loaded the dishwasher as it reduces the amount of time and water used by adjusting accordingly, reducing your overall energy consumption. The half load option is a great programme to choose when you’re clearing up in a hurry or need certain dishes ready when you are entertaining guests. 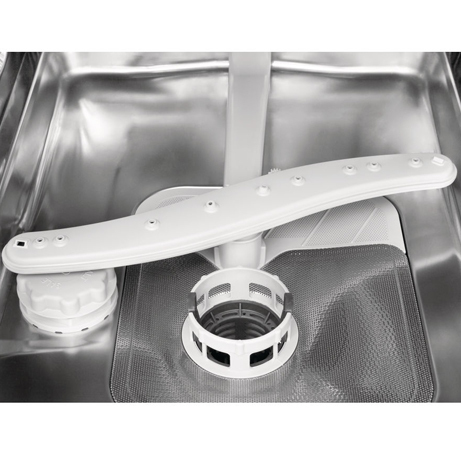 And what’s more, the Eco programme on this dishwasher helps toreduce energy and water consumption whilst still maintaining a high standard of cleaning. 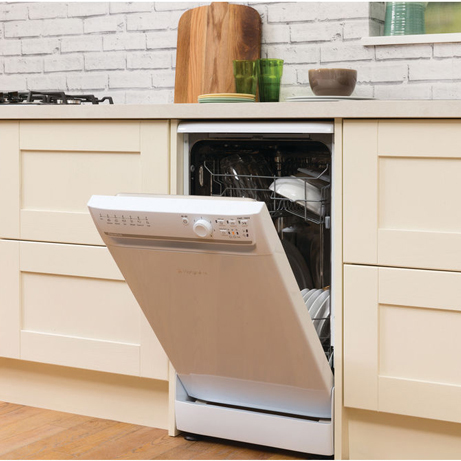 Equipped with a range of programmes, including Intensive and Half Load, this Hotpoint dishwasher provides you with ultimate flexibility when cleaning.